As a facilitator of learning, you can control some of the factors that will enhance a student’s ability to achieve. Demonstrating leadership in the classroom, providing motivation for learners and operating effective groups will increase the chances of success. Your behaviors can contribute positively to the learning process of students (listening, monitoring student progress, knowing names to make it personal, scheduling breaks, being available, changing the pace, being friendly, relaxed and at ease with the students). Modeling such attributes will assist your students to become better leaders. Effective leadership assists the group in completing its tasks and maintaining effective working relationships among its members. Generally, groups function most effectively when leadership tasks are shared among group members. The ability to diagnose and prescribe what behaviors are needed at a particular time in order for the group to function most efficiently. You may be faced with some situations that require special attention. These occasions may include student behavioral problems, discrimination issues, providing modifications for a student with a disability, dealing with grading disputes or academic dishonesty. 1. Ask students for anonymous feedback on a regular basis (What is working? What is not working?). 2. Make sure expectations are clear and in writing at the outset. Create a classroom climate of respect and responsibility. Creating an environment where everyone can feel comfortable and strive for academic excellence is taken very seriously. All students must be treated with respect. The first step is to recognize that there is, or could be, a problem and the second step is to find a way to deal with it. Remember that whatever the behavior, each student should be treated with respect and patience, not ridicule or harshness. 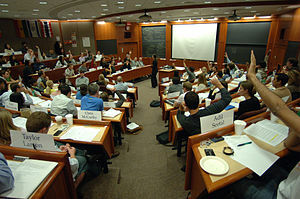 Monopolizing student – If a student is constantly taking up most of the discussion time, you can use their comments to move the discussion back to the rest of the class – “You’ve raised an interesting point, maybe others would like to comment on that.” or “That idea deserves a lot more time, perhaps we can discuss that after class”. Angry student – Try to diffuse the situation by: listening respectfully, acknowledging that they may be correct and stating your position calmly. If the situation applies to others, involve them. If you are at fault, admit your mistake and indicate your eagerness to resolve it as quickly as possible. Disruptive behavior – Actions, verbal or physical, by one or more students make it difficult for others to participate in discussion and for you to keep the class focused. In order to prevent this, make it clear from the first day of class what types of behavior are and are not acceptable and the consequences if expectations are not followed. Set the boundaries. Be firm. Remain calm. When dealing with difficult students always remain calm. Decide if you should deal with them in class or at another time. Don’t use empty threats.